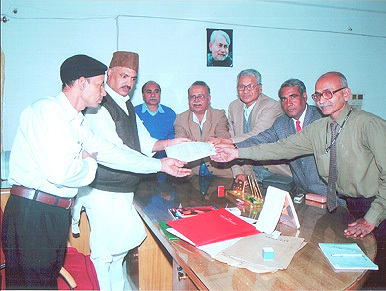 A delegation of BiharBrains met Dr. Anil Kumar , Minister of State - Independent Charge (S&T), Govt. of Bihar and presented the demand for the establishment of Indian Institute of Science Education and Research [IISER] in the State. A detailed draft was presented and discussed with the minister. The honble Minister had appreciated the efforts of the BiharBrains and assured the delegation that he will be taking up the proposal to the C.M. and Govt. of India for establishment of IISER in Bihar. It has been agreed upon by the honble Minister that state will provide the land for building infrastructure if the proposal gets approved by the Govt. of India in the same way as it was done recently for the NIFT. The BB will be informed about the developments in due course of time.